Christian Mindfulness Day Workshops can be hosted in suitable UK venues. A Day Workshop typically includes three sessions plus a Question and Answer session if requested. Each workshop can be adapted depending on the particular audience. Content may include Mindfulness of Body and Breath, Mindfulness of Thoughts, Feelings and Choices, and Mindfulness of the spiritual relationship we can have with God. This may include an exploration of the Christian Contemplative Tradition and the many ways this overlaps with mindfulness practices. A Day Workshop where a Church, Counselling Centre or Christian Group wants an introduction to Christian Mindfulness in a Group Setting. Afterwards you have the option to purchase an Annual License to present the full course yourself - see here. A Training Day specifically designed for those in Christian Leadership and Ministry. This would focus primarily on equipping those involved in ministry to help cope with the particular stresses and pressures involved. Meditation and Mindfulness can also aid recovery from low mood, anxiety, depression and other mental health related problems. The long term impact of this approach is to prioritise personal intimacy with God and build greater personal resilience. The material can also help the recovery of those on sick leave due to mental health related problems. A Schools or Youth Workshop exploring meditation and mindfulness in a fun and creative way. These can be equivalent in a length to a school period or extended to a full day depending on specific requirements. A CPD Training Day presented to a Christian Counselling Centre. 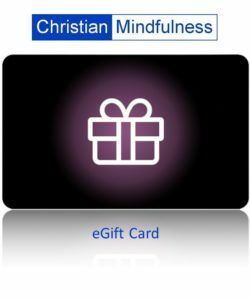 This can be an invaluable tool to aid the personal development of counsellors and psychiatrists who want to explore Meditation and Mindfulness from a Christian perspective. Theological Colleges - The material can be presented as part of a college’s curriculum and can help with the students personal and spiritual development process. Would you like to host a Day Workshop? Click here to request more information. Interested in hosting a Retreat Day with more extended times of personal prayer and meditation? Click here. Interested in upcoming workshops and events? Click here. Prefer to host a Christian Contemplation Workshop? See here. Prefer to host a Christian CBT Workshop? See here.